Years in a life where everyday was painful to get through. Feelings of wanting to end it all, and the help and hope found to get through it. Thoughts and feelings of suicide are on the rise. 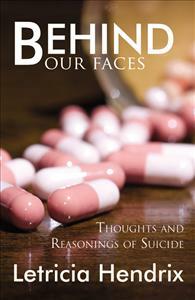 Behind our Faces: Thoughts and Reasoning’s of Suicide offers personal insight and understanding into what it’s like to just want to die, and why. Crisis of society, crisis of faith, the personal hells we impose on each other and the personal hell within ourselves. Feelings and reasons are explored, questions are pondered and hope can be found. Know what your loved one is going through. Find out that you yourself are not alone in these same feelings. Great book! You get great insight into how a suicidal views the world. And also how she wants to help others like her. Very open and personal. Who can deny that there have been moments in life that are harder than others. Moments in life where it feels like you just can ‘t go on. This book gives great insight into those feelings and gives hope in order to go on! Honest, personal, and hit close to home for me. I recently received a copy of this book from a friend and it wasn’t what I expected. Instead of a bunch of facts, it was a lot about feelings. Even some feelings I have gone through in MY life. I cried a little too! Sad, yet honest and real. The nuggets of hope were just right without feeling preachy. Thanks! A lot like being able to read someone else's diary. I read Letricia's book and it i honest, clear, thoughtful, and eventually uplifting and hopeful. I have been close to suicide on several occasions and her story brought back painful memories. Obviously, I didn't and am glad I didn't. Loved It... couldn't put it down!